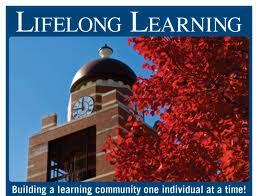 In order to walk the walk, our faculty and staff model the life long learning concept to our students. Any member of the faculty and staff can offer up a class to the rest of the faculty and staff. Classes in pie baking, physical fitness, dancing, yoga, knitting, technology tips, coffee cupping, and jogging are some of the classes/activities offered at school since September. Classes are usually offered at the end of the school day. The LLLC provides a forum for adults to teach other adults. What a great form of professional development, and inexpensive.